The Norman Course at Barefoot Resort is one of four courses offered at Barefoot Landing. The Norman course is one of the most compact courses in the area, having been designed by the legend, Greg Norman, to occupy on 60 acres of land. In the 60 acres of land he managed to pack in a par 72 golf course that is around 7200 yards, playing from the back tees. 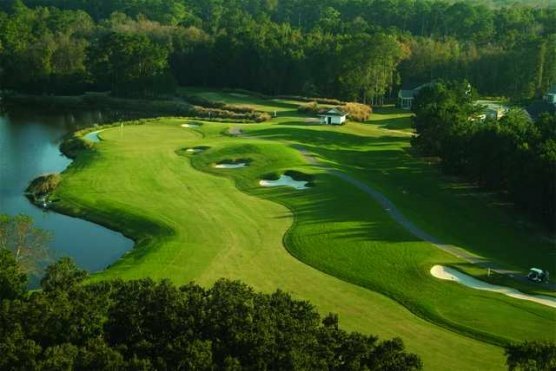 When you add the Barefoot Resort Norman Golf Course to your Myrtle Beach golf package, you are not only getting a visually stunning round of golf with 7 holes that run along the Intracoastal Waterway, but you are also getting one of the “Top 50 Courses of Myrtle Beach” as ranked by Golf Digest Magazine. The Norman Course at Barefoot Resort will challenge golfers of all skill levels. Norman designed the course to incorporate the natural vegetation to enhance the beauty of the holes. When playing this golf course, be sure to have your sand wedge handy as there are approximately 60 sand bunkers around the course that will pose some problems to many people with their sloping white faces and occasional sod walls. The greens (which have an average size of 6000+ square feet) are Champion Ultradwarf Bermuda Grass while the Tees and Fairways are GN-1 – which is a hybrid grass developed by the designer, Greg Norman. When playing along the greens you will notice that the “bump and run” shot is encouraged, as this is a shot that plays into Norman’s philosophy. This gives you an opening to play a few different shots, depending on your skill level and touch. While you are at Barefoot Resort, don’t forget about their state of the art practice facilities as well. They have a 35,000 square foot clubhouse and the range is 30 acres and lighted. The Norman Academy is also located at Barefoot Resort, so if you need some instruction, perhaps a private lesson, or just some help with your swing or grip – stop on by and see if one of the professionals can help you out. The Barefoot Resort Norman Course can be a bit pricey, as all the 4 courses in the complex can be. We suggest that you take advantage of one of our package deals, or book on our 48 hour tee time website for the best deals. Call us today and add this fantastic course to your list of courses to have in your Myrtle Beach golf package. You will be glad you did.